Labour leader Jeremy Corbyn on the platform during the Labour Party’s annual conference at the Arena and Convention Centre (ACC), in Liverpool. PRESS ASSOCIATION Photo. 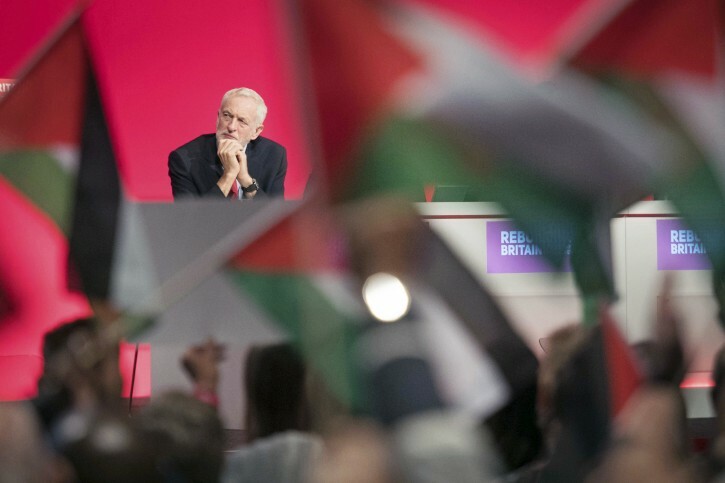 London – Britain’s main opposition Labour Party has passed a motion strongly criticizing Israel, as a senior lawmaker warned the party must root out anti-Semitism. Delegates at the party’s conference voted Tuesday to criticize Israel’s use of force against Gaza protests, urge more U.K. funding for the U.N. agency for Palestinians and back a freeze on British arms sales to Israel. The vote came after a heated debate that saw Palestinian flags waved in the convention hall.